This week, for the first time, I sat down to watch ‘The Big Painting Challenge’ in a state of complete relaxation. How wonderful, I thought, to enjoy the programme without seeing my own panic-stricken, paint-covered face staring back at me. And then, all of a sudden, I saw just that. “Jennifer has been working on the floor now for 45 minutes and still hasn’t made much progress” said the voiceover. “It’s gone a little bit too abstract at the minute” said the tutor. “I’m afraid it’s sort of meaningless to me” said the judge. As the finished abstract painting got slated, nightmarish geometric visions flashed before my eyes; memories of painting a rectangle on national TV and claiming in crazed sincerity that it encapsulated Britain’s sea-faring heritage came flooding back. I could hear the producers murmuring to one another to bring in more cameras, making sure to capture Jennifer’s tears in HD. That’s it, I thought, I can’t keep watching. But I’m glad I did. This new series, as it turns out, has set out to nurture not narrow, support not suppress, helping ten amateur painters to ‘learn, improve, and grow’. In the first episode the contestants were under pressure to show they’d learnt a thing or two about perspective. And they weren’t alone: the BBC itself seemed particularly eager to refine its previously limited point of view. Now alongside Lachlan “this is a kaleidoscope of calamity” Goudie and Daphne “I snorted with laughter when I saw your work” Todd stands third judge David Dibosa, whose charisma and positivity is warmly refreshing. Then there are tutors Pascal Anson and Diana Ali who roam the studio offering advice and tuition to the contestants, not to mention the two new presenters Mariella Frostrup and Richard Coles. Just when you’ve got used to all the new faces, in charges the entire corpus of the British Textiles and Interiors Association, who are summoned to vote for their favourite of the artists’ paintings (the chosen artist is then granted immunity until next week). This multi-perspectival approach, while well-intentioned, feels a tad chaotic, and when Lachlan said of one piece that ‘things have got a bit muddy’, I couldn’t help feeling that the programme itself was in danger of becoming overworked. Still, it is and will always be, fascinating to see ten enthusiastic amateurs bring their own approaches and experiences to the challenges. Former astro-physicist David offered an analytical, precise approach to drawing, while art student Rauridh explained how being deaf has heightened his visual awareness. After being given a traditional still life to paint, the artists then produced their own interpretation of Van Gogh’s room, a reconstruction of which was set up in the studio. A particular highlight came when Jennifer, after the disastrous first challenge, started painting over handfuls of thick hair on her canvas (perhaps in a bid to upstage the sculptural masterpiece of a moustache sported by tutor Pascal). This quirky technique worked brilliantly and echoed something of the uncomfortable, unnerving strangeness of Van Gogh’s masterpiece. And thankfully, no ears were harmed in the making of this week’s art. Looking back, being part of The Big Painting Challenge taught me more about pressure than it did about art. The judges’ comments often felt so sharp they could almost pierce straight through the canvas, leaving it, and our confidence, in tatters. But in this series the contestants seem to receive that bit of help and encouragement that would have gone such a long way back in 2015. Finally there is more room to be creative; the idea of having art tutors is a good one, and the artists are given a full day to develop and finish their ‘show-stopper’ style final challenge. For the first time, it seems the producers seemed to want to help the contestants make good art as much as good TV. Despite the insistence on a more relaxed approach, though, that uneasy tension between helping people learn before unceremoniously chucking them out when they don’t learn fast enough remains. Early in the show we met retired nurse Lesley, who told us how much she was looking forward to learning new skills and get better at something she was passionate about. But one deviation from Pascal’s apparently sacrosanct advice in pursuit of her own artistic vision, and an experimental “floating” interior spelt curtains for Lesley’s future in the competition. The ‘one leaves every week’ format that proved so successful in the GBBO tent seems slightly out of place here. Without the fear of being thrown off each week, the contestants might start taking the risks and making the mistakes that are so vital to creating great art. This fascinating group of people is no doubt capable of doing just that, and I can’t wait to see how each of them grows and develops. Here’s hoping Jennifer’s inspiringly creative approach won’t just be hair today, gone tomorrow. The one thing I am condemned never to forget is my own forgetfulness. I’m acutely aware of it now, trying to make sense in writing of a four year university degree which I have just graduated from and which has brought out the best and worst in me. Maybe if I were more of a ‘dear diary’ kind of person I’d be less worried about filling this post with clods of clichés (I wonder what the best collective noun for ‘cliché’ is – a clique of clichés? A bouquet? A syrup? ), but as things stand, it’s all a bit of a blur, and not just because hundreds of hours of reading have left my eyesight worse for wear. Graduation day was a Wednesday. What a day, Wednesday – neither here nor there, lost somewhere between Monday gloom and Friday euphoria. The weather was close, the sky dark with the threat of occasional downpours, making the atmosphere odd, almost more melancholic than celebratory. I couldn’t help thinking that, dressed in long black gowns and white hoods, stood against the tumultuous grey sky, we looked like figures in an old photograph – for me, there was a sort of fuzzy timelessness about this event which was supposed to be, in one sense at least, once in a lifetime. The service itself was conducted entirely in Latin. It was strange to hear a dead language read aloud; I noticed that ‘v’s were pronounced as ‘w’s, so Caesar’s famous ‘veni, vidi, vici’ would have sounded more like ‘wenny, widdy, wicky’. We had to go up and hold the Praelector’s finger (lol so random) and he spoke some Latin. I don’t know exactly what he said, but I imagine it was something along the lines of ‘Look, I know how many late nights and jars of Nutella it’s taken you all to get here, but it’s all worth it now. Here’s the piece of paper to prove it’. And we bowed to the Master of the College who, between the Latin, mouthed a silent, illicit ‘congratulations’ to us and handed us our degrees. And I said goodbye to my teachers and my friends and cried and felt completely weird about the whole thing. But after the open-ended strangeness of graduation, I did get closure – at the college open day I helped out at a week later. Gone were the gowns, in came the bright yellow Clare College T-Shirts, attractive to little black flies and, sadly, unattractive in most other ways. But sunny, nonetheless, like the weather that day. And like the mood – it’s always really interesting and inspiring talking to sixth-formers with bucket-loads ambition and hopes and ideas. And, thankfully, unlike at an open day several months earlier, I didn’t try to get a group of students into the library with a swipe of my Boots Advantage card. Answering questions, having asked similar ones when I went on the same open day five years ago, I felt like I'd completed the circle of university life. ‘Have you enjoyed your time here?’. Absolutely. ‘Will you miss it?’. Dreadfully. ‘What’s it been like studying history, Ella?’. It was at that point I realised there were two names on each reversible name badge, and I was wearing mine the wrong way round. I didn’t pretend to them that Cambridge is all beautiful gardens and punts and fancy dinners, because it’s not. There’s a lot of work and a lot of pressure; it’s too easy to feel like if you’re not on the brink of a breakdown you’re doing something wrong, and this year in particular I’ve come far too close for comfort to the line bordering sanity and insanity. But I’ve been supported on all sides by the most amazing people. I’m infinitely grateful for that. And, who am I kidding, it’s all been worth it, and then some. I’ve spent the year getting to read and write about some amazing foreign literature, and have painted, drawn, illustrated, and designed all the while. I even got to write about Chardin’s paintings for my dissertation (which I’ll probably go on about in a separate post). As I walked back from the open day, I took one more glance at Kings Chapel. I lived next door to it, and passed it every day on my way to the faculty. It was different every time I looked at it, but I particularly loved it when a strong evening light would fall against the yellow stone, staging it against a deep purple sky. It always reminded me of Rouen Cathedral. Not the real building (never seen it), but Monet's paintings of it. There are over thirty paintings in his series, each one an attempt to capture the play of light on the building's facade with infinite curiosity, urgency, and probably no small amount of frustration. And so, with a tear in my eye (I did promise you clichés), I went home, and that was that. And now? After the open day, open doors? Possibly. But everyone knows that a door’s not a door when it’s ajar; it’s more like a BIG SCARY CHASM INTO THE TERRIFYING UNKNOWN. In any case, though, I’m going through it armed with a degree that at times I thought I’d never get. I did it. We all did. In three words: wenny, widdy, wicky. I came, I saw, I Wikipedia’d. 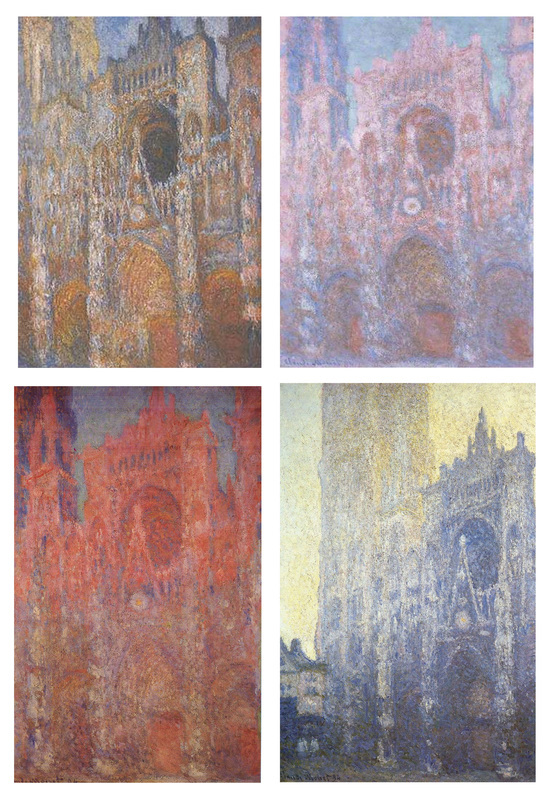 Four paintings from Monet's Rouen Cathedral series, 1892 - 1894.